Delivers A Great Workout Each And Every Class! Designed for the true Beginner student, use of proper technique is always emphasized in Roufusport’s high-energy fun Kickboxing and Boxing program. New students will immediately notice the camaraderie and relationships formed while they have fun surpassing their goals and learning the most effective striking techniques in the world. Based on Muay Thai – the 700 year old National sport of Thailand – Roufusport’s Kickboxing program is known around the world as one of the premier Striking systems available, and great to know for practical self defense. The Roufus name has been etched into the Kickboxing history books as an icon of the sport. Roufusport co-founder and head coach Duke Roufus is a 4-Time World Champion Kickboxing, Coach and Broadcaster (K-1, GLORY Kickboxing) who brings a lifetime of dedication to the sport, an extreme amount of training knowledge, and actual professional fighting experience at the highest of levels. 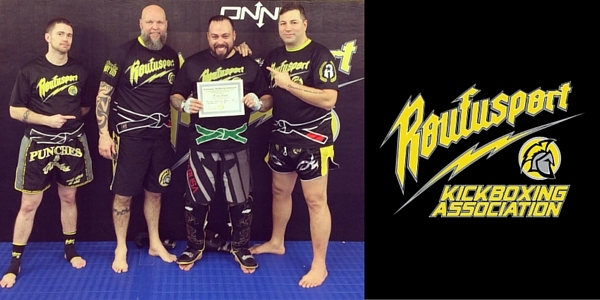 The Roufusport method is the same system taught to students at Roufusport Kickboxing Association affiliate locations worldwide and employed by top fighters everywhere, including current UFC Welterweight World Champion Tyron “The Chosen One” Woodley, former UFC Lightweight Champion and top contender Anthony “Showtime” Pettis along with their Roufusport teammates. But the best thing about Roufusport’s Striking classes is this: no student is ever forced to fight or spar. The reality is: only an extremely small percentage of Roufusport students actually compete. Come for the great fitness workout each Roufusport Kickboxing and Boxing class delivers, come for the fun you’ll have, come for the friends you’ll make, come for the stress you’ll relieve, come for the weight you’ll lose, and the confidence you’ll gain! As an added bonus for students, Boxing instruction is included in the Roufusport Kickboxing Program. Learn the sweet science in a safe and encouraging environment while training yourself into great shape. The sweet science of Boxing is a combat sport that utilizes the hands to deliver combinations of punches. 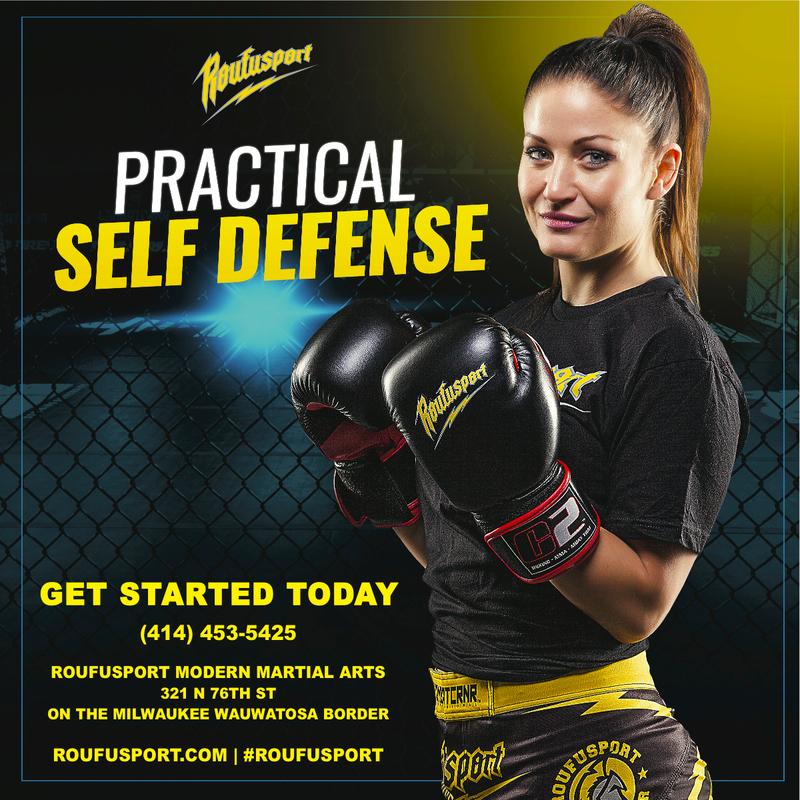 At Roufusport’s state of the art Milwaukee campus our professional instructors work with you to create well maintained balance, correct footwork, and proper technique. You will absolutely love the great workout you’ll get in each and every class you participate in at Roufusport. And the best part, no student has to fight or spar. There’s never been a better time to discover how kickboxing and boxing can change your life! That’s because at Roufusport MMA Academy, beginners can start at anytime! To find out more, just take a minute to complete the short contact form on this page to your right. A helpful Roufusport staff member will contact you so you can get started in the Roufusport Striking program today with a FREE class! Click HERE to get started now with Roufusport’s $29.99 Five Class Kickboxing & Boxing Trial Special or try our $29.99 All Inclusive (Includes Kickboxing & Boxing, Carlson Gracie Jiu-Jitsu & MMA classes, as well) Trial Special and receive a FREE pair of Roufusport Boxing Gloves ($40 value)!